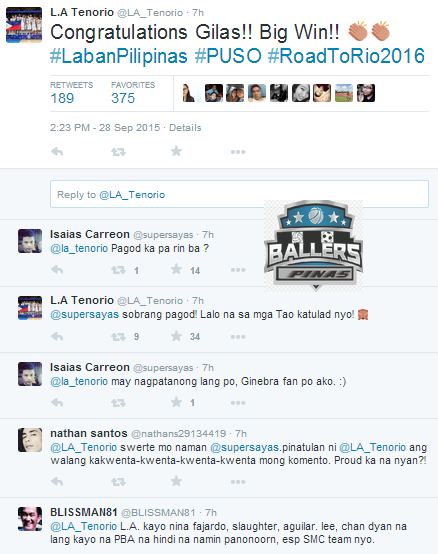 LA Tenorio attacked by Haters online after Gilas' Historic win over Iran in the FIBA Asia 2015: Tweet Scoop, Read it here! Tweet Scoop: Iran met a highly motivated Gilas Pilipinas squad led by program newcomers Calvin Abueva and Terrence Romeo who along with the mainstay ballers Jayson Castro and Andray Blatche combined for 72 points as they propelled the Philippines over the mighty Iran, 87-73. The players were all fired up after the win, but it appeared that the Filipino basketball fans were more intense online especially on this tweet below.